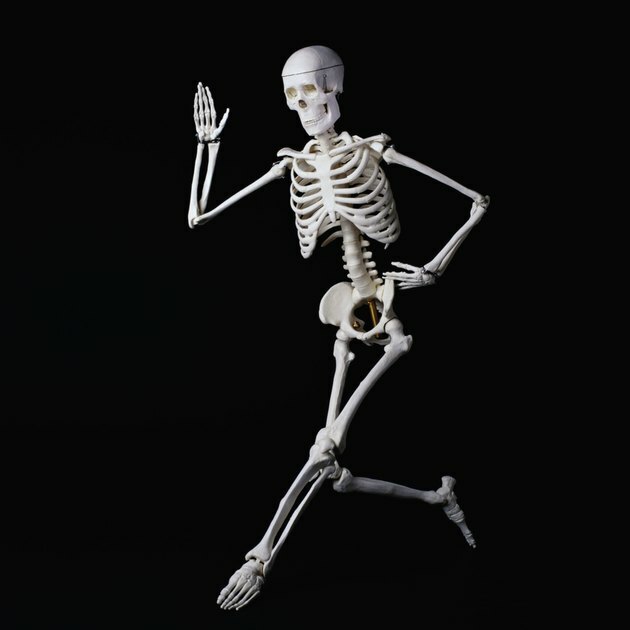 Joints are located where two bones come together, allowing movement of the human skeleton. Human joints vary in shape, each moving in a particular way for specific purposes. Some joints prevent movement, functioning mainly to stabilize part of the body, while others allow movement in several directions. The human body has three primary types of joints. Synovial joints are the most common type in the human body. These joints, also called diathroses, are further categorized into several types: ball and socket, condylar, saddle, plane, hinge and pivot joints. The bones of synovial joints are separated by spaces, allowing movement to occur in different directions. Ball and socket joints allow the most motion and include the hip and shoulder. Condylar joints, also called ellipsoid joints, have a rounded end on one bone that fits into a curved surface of another bone. The joints that connect your fingers to your hands and your thigh bone to your lower leg bone at the knee are condylar joints. Saddle joints have one bone shaped like a saddle that the other bone fits into with a complementary shape, like two pieces of a jigsaw puzzle. These joints allow forward and backward movement. The joint at the base of your thumb and the connection between your collar bone and breastbone are saddle joints. Plane joints, also called gliding joints, are located between the small bones in your wrist and between the small bones in your feet. These joints allow bones to slide and rotate. Hinge joints function similarly to a door hinge, allowing bending and straightening only. Your elbow and the small joints in your fingers are examples of hinge joints. Pivot joints allow rotation around a single axis -- the same motion as a turning doorknob. In the body, the joint between your top two spine bones and the joint between your forearm bones are pivot joints. Cartilaginous joints, also called amphiarthroses, contain bones that are connected by cartilage. These joints lack an open space between the ends of the bones. There are two types of cartilaginous joints: synchondroses and symphyses. Synchondroses are joints connected with a firm tissue called hyaline. These joints can be found in growing children and between the first rib and breastbone in adults. At maturity, no movement occurs at these joints. Symphyses are also held together by cartilage, but the tissue is more flexible. The joint between your pubic bones is an example of a symphysis joint. Some flexibility occurs at this joint, such as during childbirth. Fibrous joints, also called synarthroses, are the sturdiest joints in your body. The three types of fibrous joints are suture, gomphosis and syndesmosis. Suture joints are present between the bones in your skull. Gomphosis joints exist between teeth and the tooth sockets in your jaw. These joints do not allow movement to occur between the bones. In contrast, syndesmosis joints are more flexible, connecting bones with longer connective tissue fibers. This type of joint can be found between the forearm bones.